I seem to be stuck on the heron theme lately. 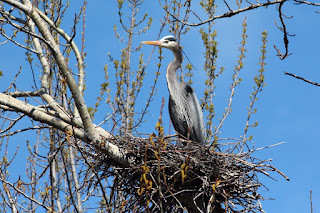 It might be because it's spring and the great blue herons are in their finest plumage and on their nests. 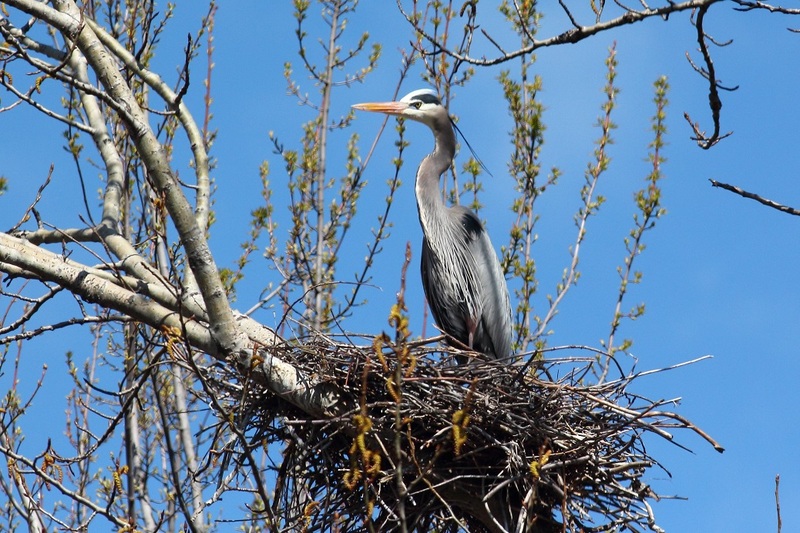 They nest in colonies called rookeries in large trees overlooking a water source. They are adorned with head plumes and showy neck feathers and the lore (the area between their beak and eye) turns a beautiful bright blue. Quite showy! I have been wanting to try a mixed media approach of combining graphite pencil and acrylic paint and thought the herons would make a good subject. My idea was to start with the first bird done completely in pencil. The second heron would have pencil with transparent acrylic washes over that. The third bird would be completely painted. The concept would echo the transformation that nature goes through every spring. I sketched out my design and chose a vertical format. I decided to also try a different technique on the background using a sponge roller. I laid out my colors then rolled the sponge through them and applied it to my board in a random pattern. By moving the roller in different directions it created a soft, diffused and blended background. I kept it lighter at the top so the first pencil sketch would show up better. In spite of that I still had to lay in some washes of white paint over that to brighten up the area. This was a learning process as I've never tried this before, but have seen other artists do similar things. In the future I may try something different where the pencil work goes to make it show up better. And here is the result so far! The first bird is mostly finished, I think. The second bird is not completely filled in with pencil yet and I still have to put the washes over the top. When I have time to work on it the process is going pretty quickly and, so far, I'm liking the results. Hopefully, I will have it finished in a few more days if I don't get distracted by the beauty of spring all around me! 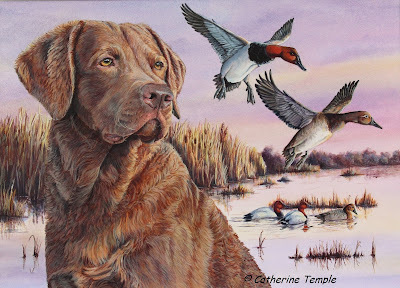 Catherine your art work is wonderful. Thank you for blogging on your process. I am curious of what kind of ground you are working on. In the photos the surface appears to have ripples, as if it has been folded, fabric or canvas paper. Using wet medium, acrylic, I assume you may be using a smooth canvas of some sort? I am using Crescent No. 100 Heavy weight illustration board. The look of ripples is actually created by the acrylic paint being put on with a roller as it blends the colors together on the board. I have not gessoed the board first and only lightly misted it and my paint enough to get it to blend. The Crescent board is cold-pressed so it has just a bit of texture to the surface.